Sports investing is full of mistakes. We try new things, put weight in this new stat or some new trend. We back a pitcher that pukes on the mound, we back a team that gets blown out. 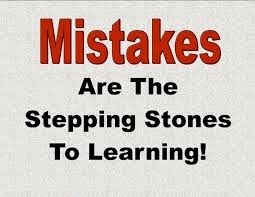 It happens, the important part is that we minimize risk and we learn from the mistakes we made. I made another mistake last night in paying too much attention to a trend/record I read on Twitter. This mistake cost me, however I minimized risk, and it was my only loss. I went 2-1 going over 60% and showing profit. The trend/record I read about was that after following an OT game the over of the next game is 9-2. Well in last night's hockey game it was clear everyone was tired and it showed as there was no scoring in the 3rd and the game ended under. I'm not a big fan of trends and I should have remembered that trends are made to be broken. We all know numbers normalize. If a guy is 2-13 against a pitcher, chances are he's "due" and gets a hit the next time faces this pitcher. We all know this and that's why we don't care about BVP stats, but other trends such as the one above will eventually fall on the other side. Don't bet trends/records blindly. Do your research, trust your gut, and minimize risk. Yesterday I stayed away from the NBA because I couldn't get a feel on what Howard's knee injury would mean for the Rockets or the Warriors. It could mean a blow out or a close game if the Rockets rallied around each other. It could have meant a high scoring game since the Rockets might not be able to defend the middle but also it could be a low scoring game since Howard is a big piece of their offense. So I just couldn't decide how it was going to go. In today's NBA game I have a great feel that the Cavs are going to miss Kyrie and their offense will suffer. I know he is listed as questionable and I'm sure he will play but he only played 27 minutes in game 1 and it went under. I can't imagine him being any more effective in game 2. Atlanta has their own injuries as DeMare Carroll is doubtful. Granted he only scored 5 points in game 1 but he has averaged 12 this year. What I'm betting on is that Kent Bazemore starts and has to defend LBJ. Atlanta works to limit LBJ since he is the only healthy scorer that can get to the rim and this in turn will limit Bazemore's offense production. Atlanta will force the Cavs to be a jump shooting team, therefore limiting the scoring as well. I think we will especially see this in the first quarter. On the diamond you might think I'm crazy for taking a suspect pitcher at Coors field but if you look at the numbers a little closer there is some value. Vogelsong is a better overall pitcher than Kendrick. They've both had a bad April but Vogelsong has had a better May only allowing 3 runs in 3 starts versus Kendrick allowing 9 in his last three starts. Finally the Rockies wOBA at home is .315 which is nothing to be proud of. Don't let the reputation for Coors field sway you from automatically dismissing visiting teams before looking a bit closer. This goes back to above about trends/records. The other pitcher I like is on the road as well pitching at Chase Field which is actually ranked a bit higher then Coors Field in runs allowed. I'm not worried though since Jon Lester is running good right now and Josh Collmenter is not. In the 4 overs I like, we have two average pitchers with explosive offenses in Detroit. In Cleveland I think Mike Leake continues to come back down to earth and Carrasco always gives up a couple. I don't trust either pitcher in the Twins/White Sox match up. Finally I highly doubt the Dodgers get shut out for the fourth time in a row.